*Price quoted is to replace an old combi boiler with a new Vaillant ecoTEC Pro 24kw combi boiler that is located on an external wall, with NEST Learning Thermostat, MagnaClean Micro 2 and MagnaCleanse of up to 8 radiators. Boiler in same location with no Gas pipe upgrade required**. 10 Year Vaillant Warranty included. All prices are subject to survey. Representative Example: Cash Price £2475 less a deposit of £1237 Total Loan amount = £1238. Repayable by 120 monthly repayments of £16. Total Charge for credit = £682.48. Total Amount Repayable £2602.50 (includes £1237 deposit). Interest rate is 9.9% per annum fixed. Representative APR 9.9% fixed. Subject to status. We are registered in England number 09611093 and are authorised and regulated by the Financial Conduct Authority. We are a credit broker and not a lender. We offer credit facilities from a panel of lenders. ** If your gas pipe from the Gas meter to the boiler is only 15mm, we will replace this with 22mm pipe at a cost of £20 per metre to conform to current regulations. Our prices quoted are for removing an old combi boiler and replacing with a new Vaillant Pro 24 condensing combi boiler, retaining the same location, which must be on an external wall, which allows a flue to exist horizontally. if your current boiler is located on an internal wall, it is likely that the flue will exit vertically through the roof. A surcharge is required on these properties, which is subject to site survey. If your old boiler is a heat only or a system boiler, an additional cost to convert to a combi and remove the hot water cylinder will be required, subject to site survey. 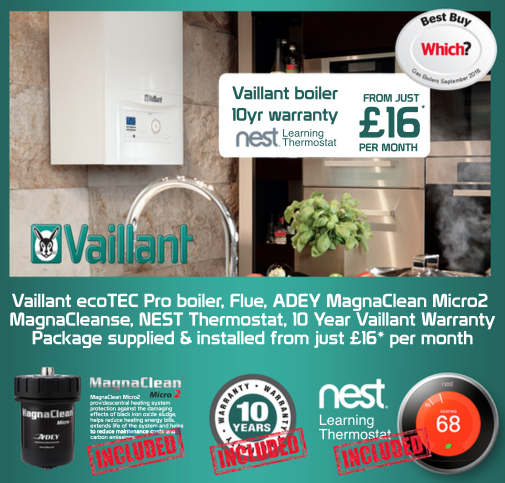 Other boilers are available, including higher KW Vaillant combination, system and heat only boilers, including the Pro, Plus, Pure and Exclusive range from Vaillant, as well as Worcester, Ideal, Vokera and other brands. Alternative heating controls available. Other extras including supply and installation of radiators and heated towel rails can be added to a finance package. Please contact us for a bespoke, no obligation quotation. Call 0800 0614849.